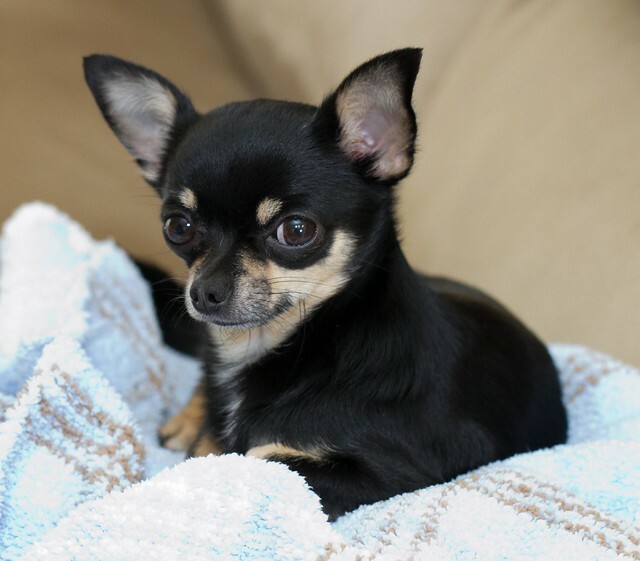 Chihuahuas are enjoyable pets--small dogs with large personalities! Like all dogs, Chihuahuas require occasional bathing. 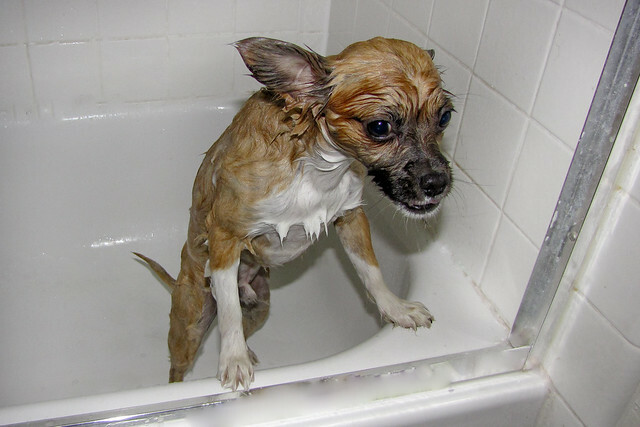 Your Chihuahua's bath frequency may depend upon whether she goes outdoors. Also, short hair Chis usually require bathing less than long hair Chis, mainly because baths keep the long hair tame. Let your dog smell gloves, shampoo, your sink, towels and any other items you'll be using as you wash your Chihuahua. Dogs perceive very strongly through smell, so it will help your dog if you give her a chance to examine the bathing implements before using them. Don't wet your Chihuahua's ears. They're prone to ear infections. You should clean your dog's ears separately when he's dry. Consult your vet if you do not yet know how to clean your dog's ears. Try bathing your dog in a small area, such as a sink with a non-slip mat in it. The mat will help your dog feel more stable as you wash her. Bathe your Chihuahua once per week or less. If you bathe him frequently, use a medicated shampoo. If your Chihuahua is particularly affectionate, wrap him in a towel and carry him about a bit. This is a dry alternative to roughing up his fur. Mind the temperature. Chis are really sensitive to the cold. Limit baths in cold temperatures and if you do bathe your dog during winter, make sure she relieves herself before her bath so she does not have to go outside wet and in the cold. Chihuahuas are skittish but love to be clean and pretty. If you make bathing a routine with a reward, your dog may come to look forward to the experience. You can reward your dog with a small treat after his bath. Praise him and deliver affection over his clean, beautiful coat. Do you have more tips for bathing Chihuahuas? Please leave them below. 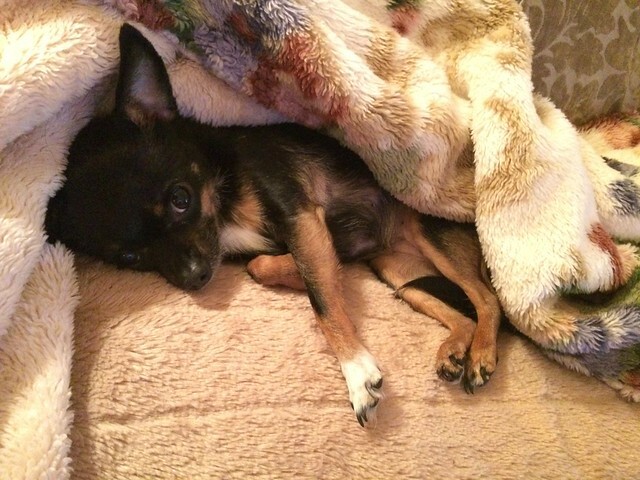 Chihuahuas are known for their major attitudes and small bodies. 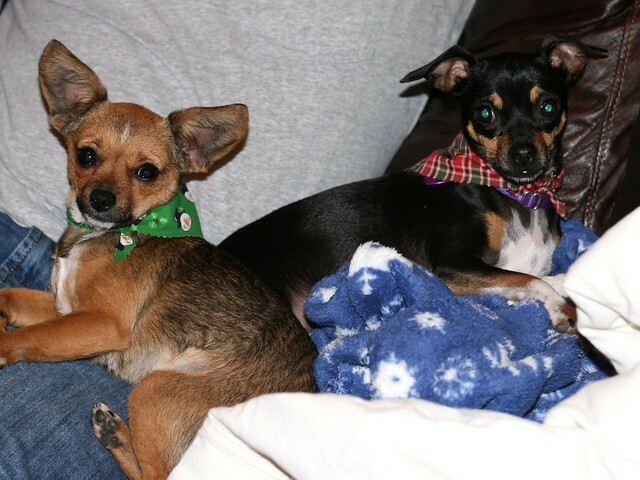 A Chihuahua may adopt a Napoleon Complex around other dogs and display overt signs of dominance. Puppy play. If possible, introduce your Chihuahua to other dogs while he is still a puppy, ideally between eight and twelve weeks of age. Pay attention to your dog's demeanor. She'll let you know if she's intimidated or uncomfortable when meeting others. If that's the case, you'll need to introduce her more gradually to new places, people and animals. Enforce consistency and patterns. If your dog does well meeting other people and animals at the park, establish a routine. Dogs adapt well to their owners' routines and your Chihuahua will enjoy the brief exercise and socialization. Find out what works and make it consistent. Paws, claws, rear and teeth. Dogs are particularly protective over certain parts of their bodies. As puppies are pet, they become accustomed to people touching them around the sensitive eyes and ears. When your Chi is young or new to the family, make a habit out of touching his mouth, rump, paws and nails. If he is reluctant, reward him with a small treat for behaving while you do this. This will help with visits to the vet and can prevent an accident in case a child ever reaches for the dog with quick movements. Your Chihuahua's vet and groomer (if you have a long-haired Chi) will also be grateful. Larger dogs and children. Chihuahuas should always socialize with larger dogs and children under supervised conditions only. It's easy for larger creatures to step on a Chihuahua or unintentionally initiate play that is too rough for the dog. Introductions on leash. Always introduce your dog to other animals while he is leashed. This reinforces your leadership role and makes your Chihuahua feel comfortable. Larger dogs should also be leashed during introduction for safety and control. Positive reinforcement works very well with Chihuahuas since they love attention! Reward your dog's positive social behavior with affection and treats. If using treats frequently, be sure to adjust your Chi's meals; you don't want her to become overweight and develop health issues. Are Bugs Poisonous to Chihuahuas and Other Dogs? Well-adjusted Chihuahuas are curious by nature. Like little kids, they love to explore new and familiar environments--and even indoors, the occasional bug becomes part of those places. There are many substances poisonous to dogs, and with Chihuahuas it's a particular concern because they are so small. Are bugs poisonous to Chihuahuas? There are several bugs that are harmful to dogs due to bite or sting. You can probably guess most of them--they're detrimental to human health, as well. Aside from bees, snakes and black widow spiders, dogs shouldn't consume caterpillars or centipedes. These bugs can be even more dangerous to dogs suffering from a more severe health condition. Dogs are usually more likely to get into other harmful things like household chemicals and cleaners, chocolate and pesticides. If your dog has ingested a bug or other substance and exhibits signs of illness, observe your dog and call the vet. Check your household chemicals to see what the dog might have consumed if it wasn't organic. 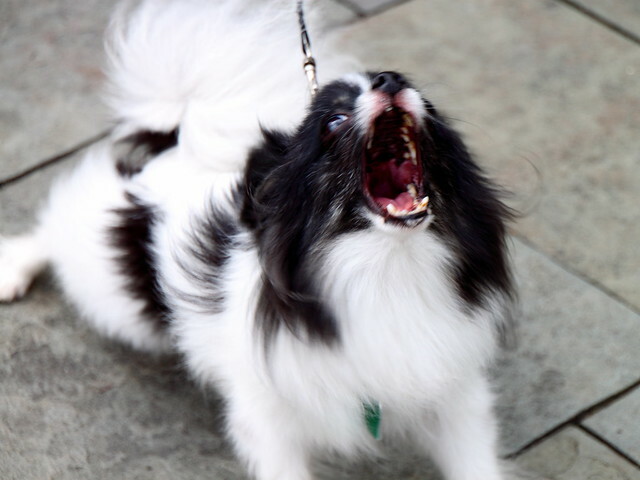 Chihuahuas and other small breeds are especially prone to dental problems. While dogs have heartier teeth than humans, they're still afflicted by dental problems such as gingivitis and plaque. Diet and prevention can help your dog maintain healthy dental hygiene without costly trips to the vet. 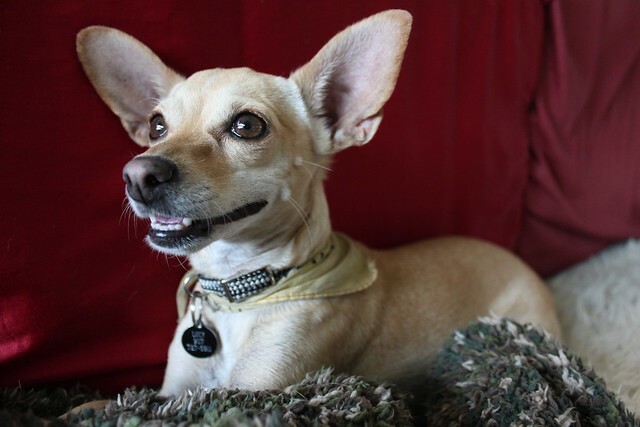 Chihuahua dental problems do increase your pet health care costs. Additionally, they can create discomfort for your dog. Here are some ways to recognize, prevent and treat dental decay in Chihuahuas. Chihuahuas are small, but they have needle-like teeth that hurt when they bite. You can prevent bites and frustration by helping your dog get used to the ritual of tooth-brushing. Begin by petting your dog and touching her mouth. Eventually, touch your Chihuahua's mouth and teeth. Before you attempt to brush your Chihuahua's teeth, let her smell, inspect and lick the toothbrush and toothpaste. Remember, your dog's primary sense is his sense of smell; he'll be more comfortable with the objects after a proper introduction. This practice can also deter food aggression and will help you safely retrieve any forbidden or harmful objects from your dog's mouth. If your Chihuahua has bad breath, it means she's past due for a brushing. As in humans, lingering bacteria in the mouth causes a nasty, unpleasant odor. 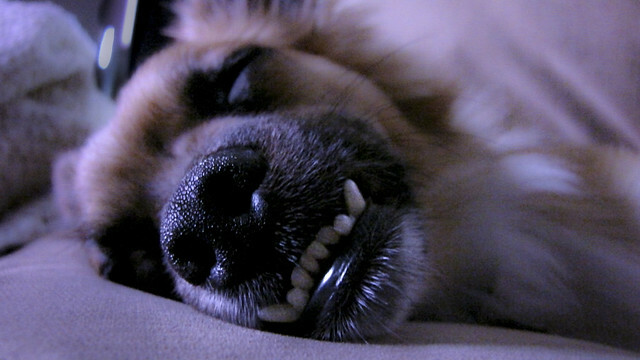 While 'dog breath' is normal, particularly odorous breath is indicative of potential decay. Your dog's family, friends and veterinarian will also appreciate the lack of odor after brushing has occurred. It's true that wet food and table scraps can increase bad breath and lead to poor dental health in dogs. Consult your veterinarian concerning your Chihuahua's diet. Ultimately, senior Chihuahuas may need to eat wet food because of the fragility of their teeth. More wet food and table scraps means more brushing for your dog. Wet food and table scraps can also lead to obesity in Chihuahuas. Many pet owners dread brushing their animals' teeth, but over time it becomes a manageable process. A finger brush (available from your vet or most pet stores) is most effective--especially on a Chihuahua since her mouth is small. Don't forget to use toothpaste for dogs as well. As you brush your Chihuahua's teeth, provide treats and positive reinforcement, rewarding the dog for allowing you to brush his teeth. Whether at the dog park or out for a walk around the neighborhood with your dog, it's likely that you will eventually encounter a dog that shows aggression towards you or your pet. In some situations, the aggression is obvious as soon as you encounter the dog. In other circumstances, dogs appear to suddenly decide they don't get along and a fight begins. I take my Boxer Odin on walks regularly, and we've encountered aggressive dogs in a few situations. This is what I've learned from those encounters. To prevent encounters with aggressive dogs, you should learn how to recognize signs of aggression. This is really important for me, because Odin always wants to immediately play with another dog, but that other dog doesn't necessarily want to play with him. I have to deliberately pace Odin's greeting and make sure he doesn't get too playful at initial encounter. During that greeting, I am always aware of the other dog's body language. Before a dog outright growls or snarls, he usually displays cautious movements and offers others a look that seems to say 'stay away.' The dog may also cower near his owner or look scared, which can lead to defensive, fear aggressive behavior. When we encounter a dog like this, I use the leash to guide Odin back and make him sit by my side. Before allowing Odin to initiate greeting with another dog, I always ask the other dog's owner if that dog is friendly and playful. Each dog will react differently towards aggressive animals. Some dogs will lunge at dogs who show aggression; others will become confused. Odin is the latter type of dog. He prefers to defend me, but sometimes he'll look up at me and yelp in confusion if an aggressive dog is near. This happens frequently when the aggressive dog is behind a fence. Because we are not in immediate danger, I take the time to show my dog that I'm the leader, walking confidently past the gated animal. Sometimes Odin will follow my lead and adapt the same demeanor; other times he still freaks out a bit. When this happens, I calmly and assertively tug at his collar until he follows along, eyes ahead instead of looking at the aggressive animal we've passed. Sometimes, you will have the opportunity to avoid an aggressive dog. If this is the case, take the opportunity. There is no reason you should risk the safety of yourself, your dog, or the other dog. In our old neighborhood, there lived two aggressive dogs. When walking Odin, I simply turned around or walked on the other side of the street to avoid provoking the aggressive dogs. This also reinforced the fact that I was the leader and in charge of the walk, and after switching things up a few times, I noticed Odin more easily adapted my calm attitude and seemed to trust my judgment more on walks. In the event of an aggressive dog attack, protect yourself first. Call 9-1-1, try to remain calm, and do not turn your back on the aggressive dog. Avoid making eye contact with the attacking dog and do not show it your teeth - that includes smiling. Avoid yelling at the dog or punching back. If taken to the ground, curl up, ball your fists, and use your arms to cover your head until help arrives. Unfortunately, not all aggressive dog encounters are preventable. We used to live next door to a family that owned an aggressive dog. While we had a fence between our yards, their dog would still bark and snarl. To avoid fights and to keep the noise level down for our other neighbors, we would arrange a schedule with the neighbors to ensure that neither dog was out in the fenced-in yard while the other was present. If you ever encounter an unleashed dog (aggressive or not), you should contact your local animal control center to prevent injury to people and animals. You can also access immediate assistance through your local police department.